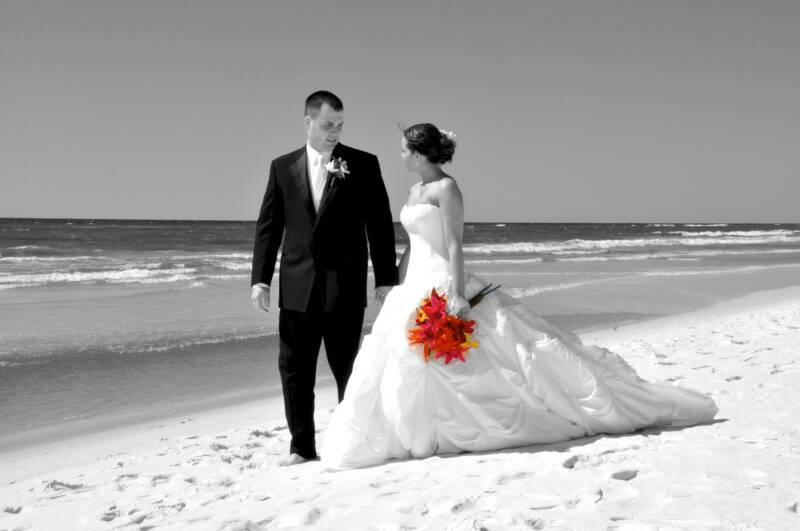 Ultimate Navarre Beach Weddings and Vow Renewals are popular in Florida all along the emerald coast.There are many locations to have your marriage ceremony and vow renewals in a Navarre Florida Wedding.There are several County beach access's and several great State Park's that are on the Gulf waters with sugar white sands that also allow Navarre Florida Weddings that are free for the bride and groom to use.The parks is great for the bride and groom that cannot stay at a beach front condo or house or that just wants a more private marriage ceremony or vow renewals.Navarre Weddings have been very popular as a destination for a Florida Beach Wedding along the panhandle of Florida.Brides love the Sugar white sands to have their marriage ceremony and vow renewals..
We furnish Navarre beach wedding packages that includes setup with a minister or officiant and professional photography for the Ultimate wedding in Navarre,Fl. There are lots of beach houses and condo's for rent on beautiful Navarre Beach located in the panhandle only 20 miles to Destin and 10 miles to Pensacola beach,Accommodations in Navarre for a beach house or high rise condo overlooking the Gulf are also reasonable and wedding friendly. View our packages page for additional information and prices.